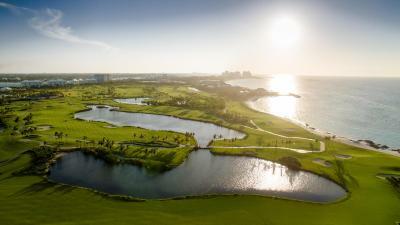 Lock in a great price for The Cove at Atlantis - rated 8.1 by recent guests. 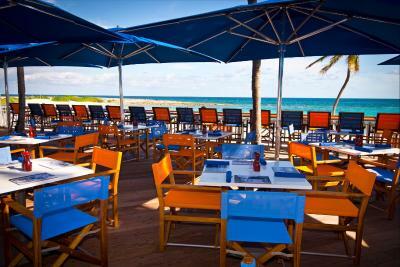 Excellent breakfast & restaurants. 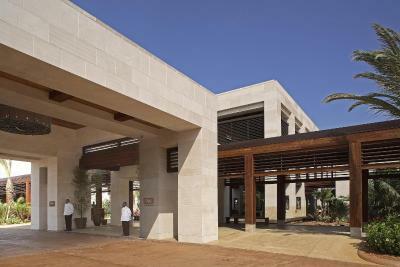 Beautiful facilities and very friendly helpful staff. I think he price was too high but the facility amazing. 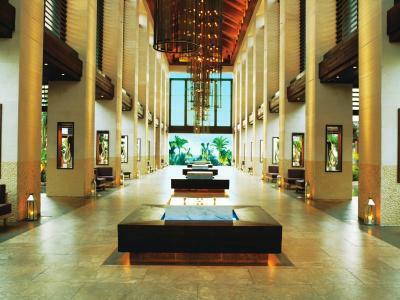 Cove Atlantis has a stylish lobby. The waterpark is rather unik for a hotel. 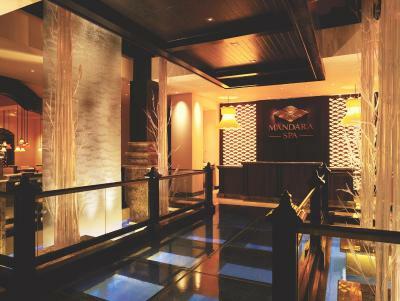 The Mandara spa is good and about the only things that seem to be in the price range of five star hotel. Amazing, started with a very warm welcome at the reception. We didn't expect the room to be ready in the morning already, but the reception made it happen, thanks again! The Atlantis staff in all areas is just brilliant, very friendly, helpful and absolutely professional. Yes, the hotel has its price, but its worth it. 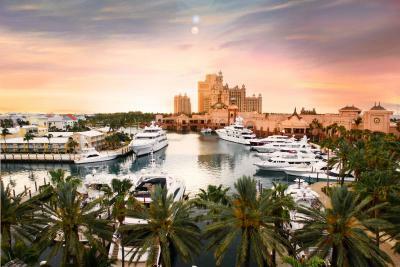 Nothing to complain, room, beach and all other amenities of the Atlantis are perfect. A Luxury hotel.Everything is nice.Great view from the room. 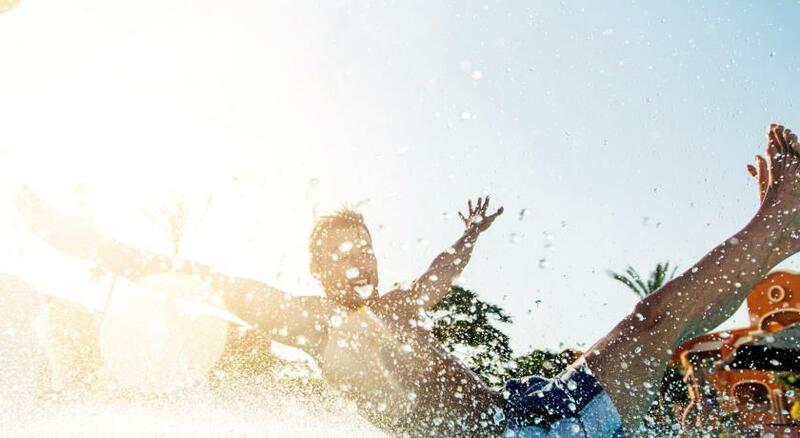 Great restaurants and choice of amenities - easy to pay great water park. The property location is perfect, view is amazing, staffs are really helpful ( Chakara and Darril from Cove reception were exceptional), beaches are beautiful, property is well maintained and secured, room service is great, cleanliness is perfect, enough pool area for everyone, so much activities to do and such a big resort to explore. One of the best experience we ever had. Featuring luxury oceanfront suites, this Atlantis resort area includes its own large outdoor pool facility just for adults and a private beach area. A selection of dining and gaming options is also available. The bright, spacious suites of The Cove Atlantis feature a private balcony with views of the ocean. A marble bathroom, flat-screen cable TV and iPod docking station are included. Free unlimited local calls are also granted. The Cove pool provides 3 beautiful pools with an outdoor gaming pavilion, private cabanas and poolside bar. 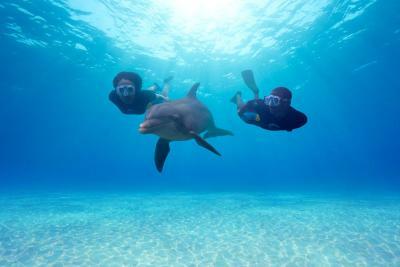 Dolphin Cay, Aquaventure water park and golfing are also offered. Guests will enjoy free access to the Atlantis Movie Theatre and casino lessons. 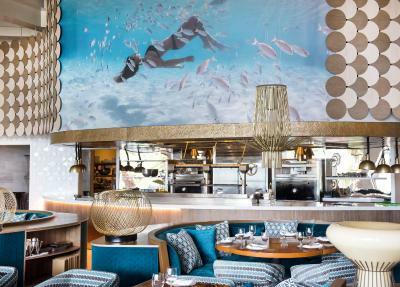 Guests can enjoy casual to fine dining at any of the 21 restaurants at Atlantis. 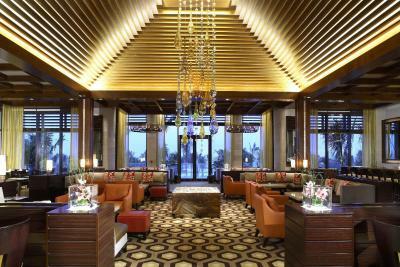 Guests can also play casino games while relaxing with cocktails at the Seaglass lounge or one of the 19 bars. 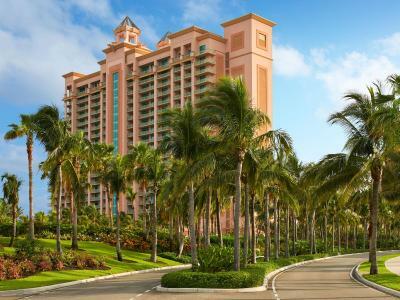 The Atlantis Cove is 17.4 miles from Nassau International Airport. The Antiquities Museum is a 5-minute walk away. 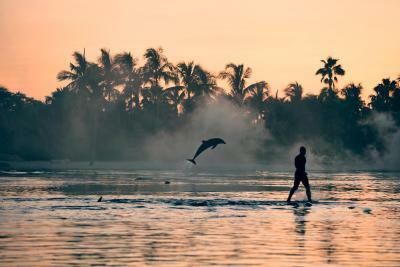 Paradise Island is a great choice for travellers interested in beaches, relaxation and sunbathing. 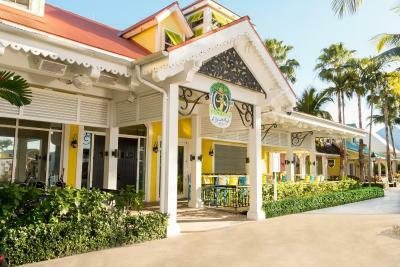 This property also has one of the best-rated locations in Nassau! Guests are happier about it compared to other properties in the area. 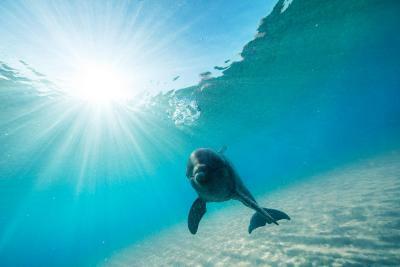 The Cove at Atlantis has been welcoming Booking.com guests since 4 Aug 2011. 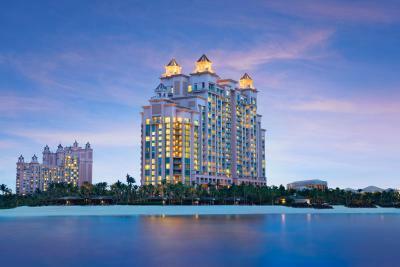 When would you like to stay at The Cove at Atlantis? 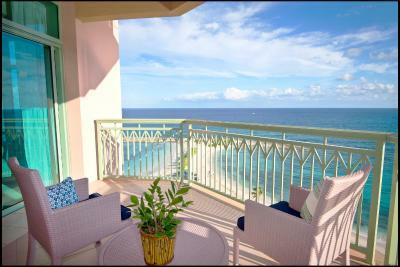 Located on floors 1-3, these bright, spacious suites feature a private balcony with views of the ocean. A marble bathroom, flat-screen cable TV and iPod docking station are included. 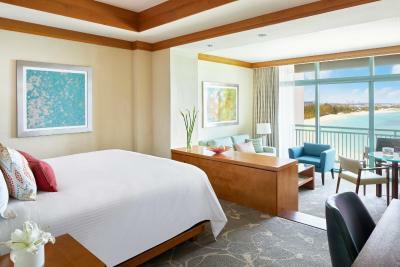 Located on floors 4-19, these bright, spacious Deluxe suites feature a private balcony with views of the ocean. A marble bathroom, flat-screen cable TV and iPod docking station are included. Located on floors 20 - 22, this air-conditioned room features a sunken sitting area, a large wardrobe, an iPod dock, flat-screen cable TV and a balcony with ocean views. The bathroom has a bathtub or a shower. 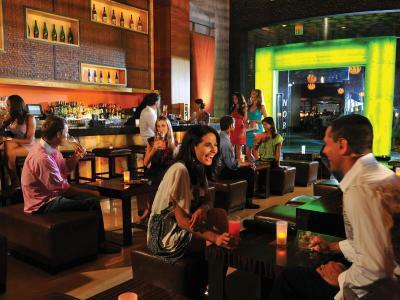 Guests enjoy full access to the Club Lounge. 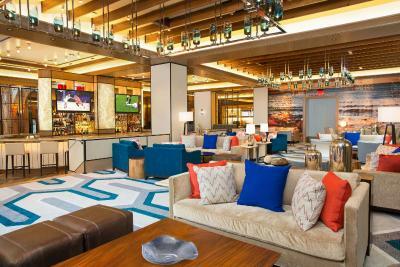 On the top five floors, these air-conditioned suites feature a sunken sitting area, iPod dock, flat-screen cable TV and a balcony with ocean views. The bathroom has a bathtub or a shower. Club Lounge Access. Club-level Suite on the top five floors with ocean views. Master bedroom with king bed, Spacious Master bathroom, Separate dining area and living area with sofa. Offers Club Lounge Access. Located on floors 8 through 15 this suite features a balcony with a view, cable TV and seating area. Located on floors 8 through 15, this suite features a larger floor plans for added space and comfort. It offers a variety of views from the full and French balconies. 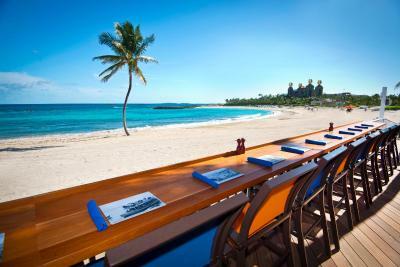 It also offers a tranquil ocean view and extended views of either Nassau Harbor or Atlantis’ waterscape. Located on floors 4-19 with 2 Queen Beds and a Sleeper Sofa. 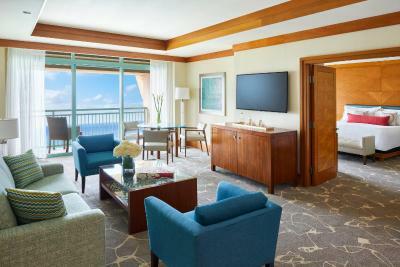 This suite offer guests a sitting area and a balcony and ocean views. Property surroundings – This neighbourhood is a great choice for travellers interested in beaches, relaxation and sunbathing – Check location Great location - show map Guests loved walking around the neighbourhood! 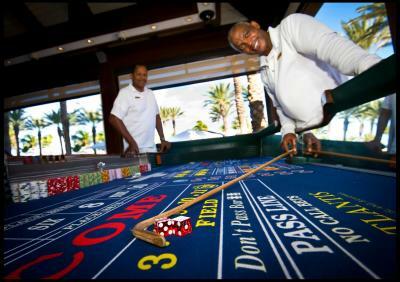 House rules The Cove at Atlantis takes special requests - add in the next step! 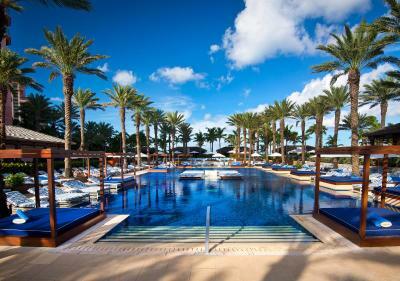 The Cove at Atlantis accepts these cards and reserves the right to temporarily hold an amount prior to arrival. Minimum check-in age at The Cove is 21. Maximum occupancy in the Ocean Suite, Deluxe Ocean Suite, Club Deluxe Suite and Indigo Suite is 3 adults and 1 child under 4. 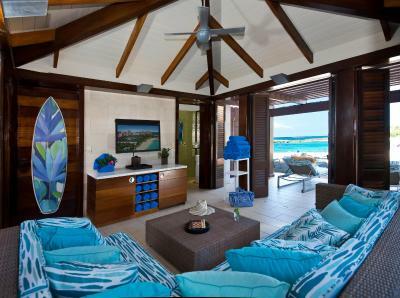 Maximum occupancy for the Azure and Sapphire Suites is 4 adults and 1 child under 4. Children 11 years and younger stay for free with paying adults. Children ages 12-17 pay $50 per nights plus daily housekeeping gratuities. Extra person, 18 years and older, pay $75 per person, per night plus daily housekeeping gratuities. 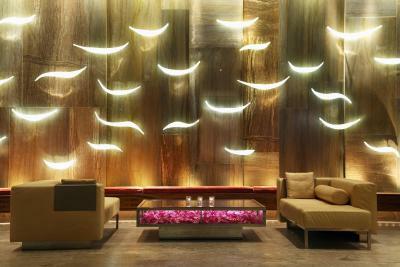 Upon check-in, a credit card guarantee or cash deposit of USD 250 per room per day will be held for incidental charges. Upon check-out, guests are required to settle any outstanding charges in full using a credit card, travellers’ checks or US dollars. Mandatory Housekeeping Gratuities of $US 6.00 per person per night, 12 and older, for Ocean and Deluxe Ocean Suites and $US 12.00 per person per night, 12 and older, for Azure and Sapphire Suites. 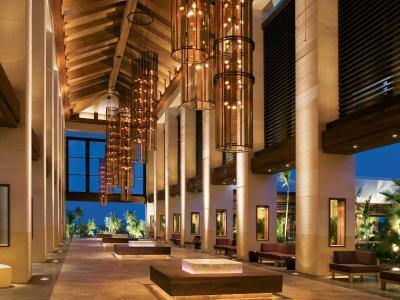 Your stay at Atlantis is subject to important legal terms and conditions that effect your legal rights and mandate disputes be resolved exclusively before a Court in The Bahamas. Please read the terms and conditions on the hotel's website. •	If cancelled or modified up to 15 days before date of arrival, no fee will be charged. •	If cancelled or modified later, 100 percent of the first two nights plus applicable taxes and resort levies will be charged. •	If cancelled more than one day after booking, 100 percent of the room cost plus applicable taxes and resort levies will be charged. Exclusive Suite Benefits: Guest booking the Azure or Sapphire Suites will receive daily breakfast for two and late checkout based on availability. No credit provided for unused components and benefits are subject to blackout dates. 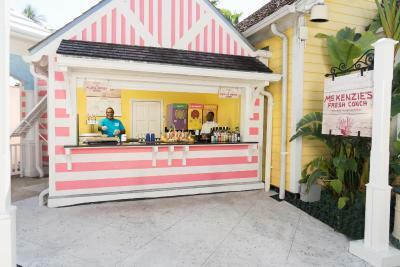 Food and drinks are very expensive on the Atlantis resort -- the "12% VAT" in the Bahamas is a major contributor to high cost of hotels, food, drinks, etc. I had no issues at all. View was beautiful the sun rise was everything. Loved it! Price. Paying for Figi water and receiving Dasani as the complimentary water. The extended time it takes to get hot water in the shower in our room on the 21st floor of the Cove. The entire staff of the Club on the 22nd floor were all excellent! 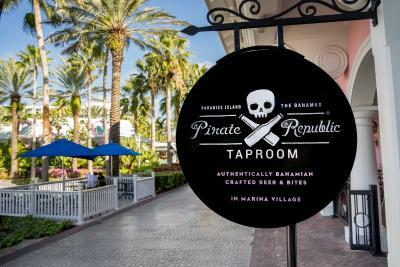 there could have been more explicit information about the activities available, in the resort and in nassau. The hotel is outrageously overpriced. The food in the restsurants is of high quality but the prices are still too high. 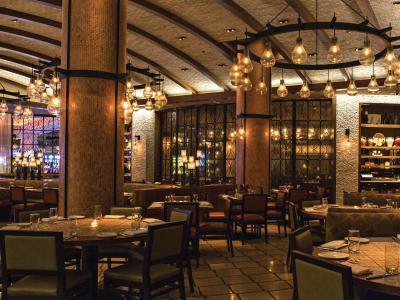 The interior design and athmosphere of the restaurants (we went to Nobu and Olives) is not the style of a top restaurant that the price would let you assume. The service was by no means at the level of a five star hotel. There were seversl occations that I didn’t get service when dialing the reseption. Our luggage was not delivered to our room the day we arrived. The room rate was with taxes about 1000 dollars per night. 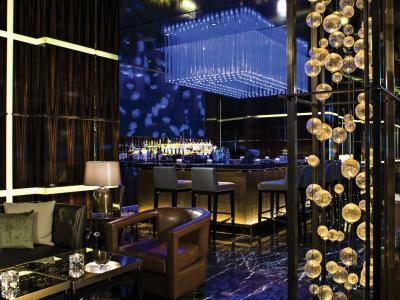 For that amouth of money you would expect everything to be at the level of a five star hotel. The room was uggly. It had this 1990 desing. This ofcourse a matter of opinion but for that amouth of money you would expect everything to be luxureous and up to current desing standards. The hotel is relatively far from Nasssu city and the hotel does not provide for any shuttle buss to the city. I can understand why. There are many good redtsurants in the city for about half the price of Atlantis. For a European it’s maybe good to know that the hotel is full of Americans. It feels a bit like the Canary Islands. Just much more expensive. I wouldn’t recomend the Atlantis hotel for anyone. The resort is a rip off. They charge you for everything including breathing !!! All of the food is very expensive and overpriced. I don’t recommend anyone go here unless you have children. And non children couples, go somewhere else. The ocean and the water parks were great. We enjoyed the relaxing weather too. Honestly, the staff was spotty. Some were so friendly, and others acted like they were being bothered. At a very expensive hotel, everyone should be friendly or at least try. The casino staff were the worst. The room was beautiful, we had an ocean view. The balcony was TINY so it was hard to sit outside with more than two people. The restaurants were excellent, but pricey. THE breakfast buffet was awesome. Way too expensive and inclusive fee is ridiculous. Could not get reservations to do anything in the hotel at all. No dining, no massages. Forced to use a room key when wanting to just pay upfront for things. Loved the people but the service was very slow. Breakfast is very nice .Concierge people very kind and try to help.our room Ocean deluxe suite very nice and beautiful view .chattel bus to other hotels useful .beach is nice .